The topic of traditional medicine used in concert with traditional astrology is a massive one and deserving of several volumes. Happily, these exist and date back to early antiquity, continuing to be developed throughout the 17th century by authors such as Nicolas Culpeper, a student of William Lilly. Richard Saunders. an accomplished physician, all of whom were part of a larger group of what might be called ‘medical activists’ who wanted the practice of medicine to be available to the common people. This is the time in our history when the art of midwifery was being denied to the peasantry and absorbed by male physicians. In many respects, these struggles continue. This is written as an introductory piece, demonstrating the various elements and history of the art. For those who seek a more in-depth view, there are some very fine contemporary books written on the subject, such as Heal Thyself: Nicolas Culper and the Seventeenth Century Struggle to Bring Medicine to the People by Benjamin Woolley; Culpeper’s Medicine A Practise of Western Holistic Medicine by Graeme Tobyn and Passions and Tempers: a History of the Humours by Noga Arikha. Virtually all the seminal texts from Hippocrates through the Seventeenth century are readily available. In his article “Delusions of Medicine” (2112) Professor Henry Draper, MD writes: ” It is instructive to the philosophical physician to trace, as in the case of Greece, the passage through fetichism, miracle-cure, and astrol­ogy to a sound system of medicine such as that propagated by Hippocrates, well called the Divine Old Man. ” The article is for the most part well informed and well written I agree with some of his conclusions. Nevertheless, I think this is another case of something assuming they know what astrology is when they clearly do not. There is really no place in astrological medicine for what I think he means by” fetishism” or the offer of “miracle cures.” Moreover, and this is the greatest irony, Hippocrates with Galen were and are the greatest primary Classical sources for medicine in concert with astrology. This is rather like the Christian who believes that astrology is evil because scripture warns against fortune tellers, necromancers, and poisoners. Again, no informed or self-respecting astrologer would accept any of those titles as being even remotely relevant to what they do. This subject is deserving of another post that is already in the works. For now, I will say that traditional astrology properly used and for the right reasons is both beneficial and conducive to Christianity if the judgment of someone such as St. Thomas Aquinas is to be given consideration. Our immediate interest is in the legitimate and ancient art of astrological diagnosis, using astrological techniques. These have been tried and true for millennia and are still relevant. Modern medicine has made enormous contributions to healing, largely in the realm of diagnostic technology. antibiotics and other drugs. However, here traditional and modern can co-exist to some extent. It has to be said, however, that even now a definite and timely diagnosis of many ailments are not as effective as they might be. Also, many modern drugs are toxic to the body and can often trigger secondary problems. Modern allopathic medicine treats the symptoms of dis-ease. Traditional Western medicine is holistic and sees the human being within the context of the macrocosmic/microcosmic relationship. In the spirit of introduction to traditional astrological theory and practice, we can begin with what has come to be known as the Astrological Man. Contemporary modern astrologers associate each sign with a house. No matter what the ascendant, the first house ‘belongs’ to Aries and the twelfth to Pisces. This is a modern aberration and has nothing to do with traditional astrology except in the correlations between parts of the human anatomy. Although there are some applications of this in horary astrology, the most important is as a tool in medical astrology. The image above is a simple reference tool – one can readily see the correspondences between the parts of the human body and the sign to which they are associated. For it to make any practical sense for an individual, we use the natal chart. In Lilly’s day, it would look something like this. The image itself is believed to derive from Egyptian sources. 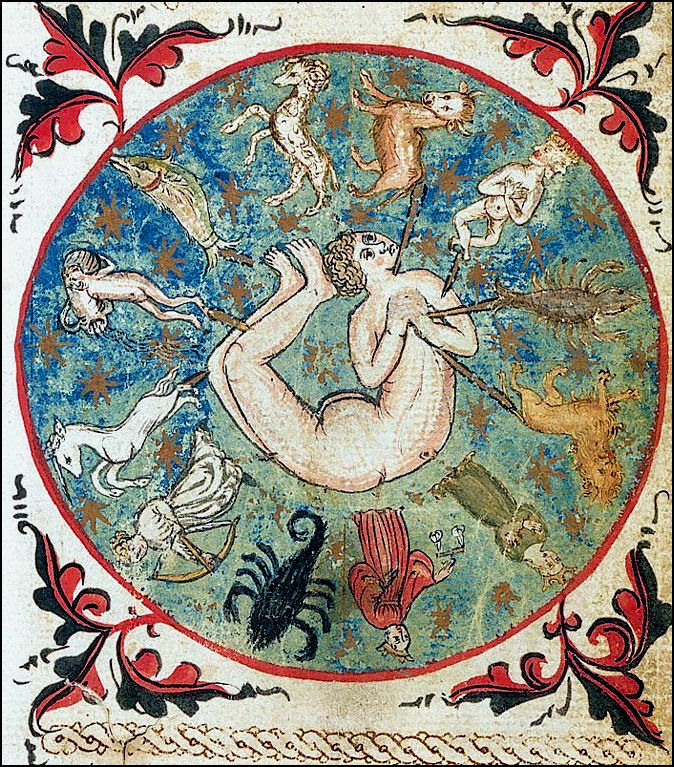 You can see also that the human form is placed in a circular position with the head in Aries and the feet in Pisces – the alpha and omega. 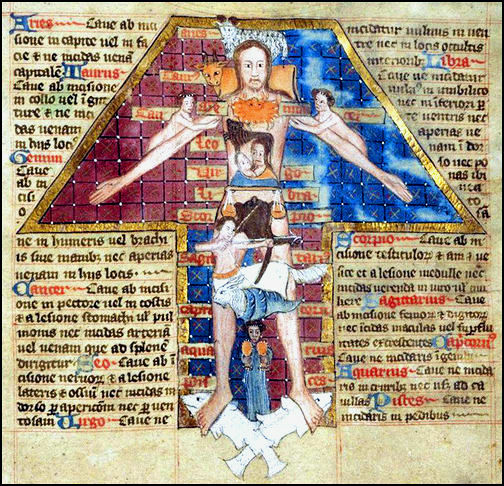 “Humoral” derives from the word “humor,” which, means “fluid.” The human body was thought to contain a mixture of the four humors – black bile (melancholy), yellow or red bile, blood (sanguine) and phlegm. Each individual has a particular humoral constitution. In this system, health is defined as the proper humoral balance for that particular individual. An imbalance of the humors is considered at the root of illness. 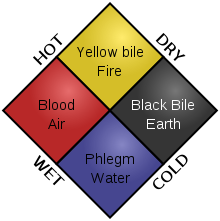 The humors are also used to refer to the four individual psychological temperaments: melancholic, sanguine, choleric, and phlegmatic. What is immediately relevant here is the fact that the physical health and individual personality were part of the same whole. The development of humoral theory is associated originally with Hippocrates (ca. 460–370 BCE). In the second century CE, Galen elaborated on this theory, which was further developed by Arabic writers beginning in the 9th century and by European writers beginning in the 11th. Though several important publications—Andreas Vesalius’s De Humani Corporis Fabrica in 1543 and William Harvey’s De Motu Cordis in 1628—challenged aspects of humoral theory, it remained dominant among both physicians and the public through the 19th century. This system is always used in concert with the humoral medicine of Galan and Hippocrates. Modern medicine tends to believe that a given medicine will work the same way for different people. That may be true of some treatments but certainly not the vast majority. 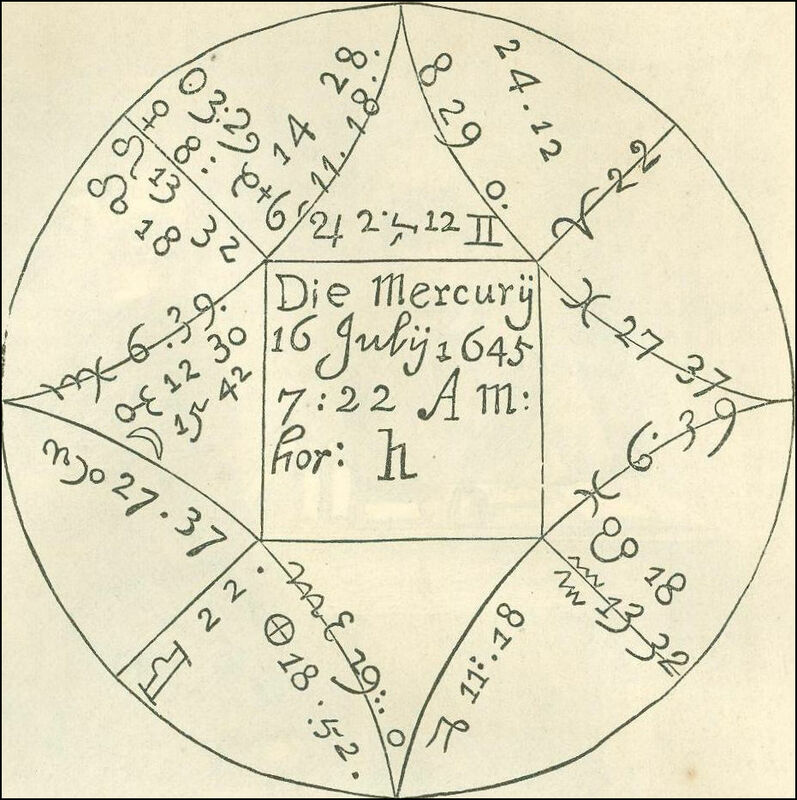 Traditional astrological medicine determines the Temperament of the patient by reading the Humoural nature of the chart, communicated by the planets in signs, among other considerations. People who have a very strong Choleric nature, which is hot and dry, will tend to suffer from more fevers than someone with a Phlegmatic temperament, which is cold and wet. This is not the place to engage in a detailed explanation of Humoral medicine, but suffice it to say that only a foolish doctor would treat the two as they were exactly the same. The planets are also associated with anatomy in a wider sense. To give a small sample, Saturn governs bones and teeth, but also long and chronic illness. Mars governs the blood and is also associated with cuts (including surgery) and fevers. Mercury is associated with the nervous system and is a part of the assessment of mental disorders, often in concert with the Moon or Saturn. Clearly, all of the components must be read in the process of diagnostics. I hope at some later date to delve into this more deeply on this blog, for those who have an interest. This entry was posted in Medical Astrology, Melancholy, Mercury, Traditional Astrology. It should not surprise us the precision and expertise of your articles, dear Peter. Great job. Reblogged this on Kartanje sa Sudbinom.